In 1987 The Ring Of Troth was one of the organisations coming forth from the Asatru Free Assembly (the other was the Asatru Alliance, which would later become the Asatru Folk Assembly). The Ring Of Troth was founded by Edred Thorsson and James Chisholm. The former left the organisation in 1995 due to controversies around his membership of the Temple Of Seth. Thorsson is of course nowadays more famous for running the Rune Gild and as an author on eoteric heathen topics. The Troth came up with something smart. 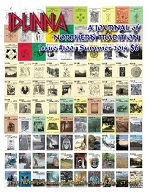 They digitalised their periodical Idunna which is now available from the self-publishing-on-demand company Lulu.com. You can pick an ebook or printed version. Each and every issue, from the first of 1988 to the 103th of Spring 2015 is available from Lulu. When I noticed this, I looked around which issue(s) to buy and I figured I would try the 100th issue (Summer 2014) because it is a ‘best of’ compilation. That should give a good idea of the development of the magazine. #100 Opens with a recent and an old “Steersman”s introduction. Then follow two (relatively) famous (ex?) members, the earlier mentioned Thorsson and Eric Wodening who is nowadays better known as a major figure in the þheodism-movement (his brother Swain is also featured by the way). Now of course The Troth is an “inclusive” heathen organisation, so a þeodsman, Asatruar or whatever kind of heathen can still be a member, but those are not the first names I expected. Two people who I did expect are Kveldulf Gundarsson and Diana Paxson who are, of course, featured. Of Winifred Hodge a text about oathing is reprinted. Then follows a text is about Seiðr (by Jordsvin), a fairly odd (yet amusing) text about psychic ‘warfare’. There are texts about Alfar, hospitality, handicraft, cooking and there is poety and some humour. The best text (in my opinion) is Ben Waggoner’s “Some Thoughts on Evolution”, a heathen take on the creation of things of someone who is a teacher on the subject of evolution in his ‘normal life’. The 100th Idunna is an A4-sized, magazine-styled, 50 page publication, quite like the normal issues I assume. They did not turn the celebration issue into a thick book or anything looking more festive than a regular issue. The upside of that is that also this issue costs only $ 6,- like any other issue. The lay-out looks a bit like somebody is still trying to find his/her way with DSP software (‘desktop publishing’). Some articles are printed in one column, other in two, yet other in three. Fortunately the fonts and font-size are the same throughout the publication, but the headings get all kinds of weird fonts. A matter of taste I asume. I guess #100 gives a descent overview of almost three decades of Idunna with a variety of subjects and authors. I found it mostly just an amusing read with a couple of more interesting texts. An intention to buy and read all other issues did not really grow from this encounter, but I guess that when I will make some Lulu order in the future, I just might get myself one or two Idunnas again.